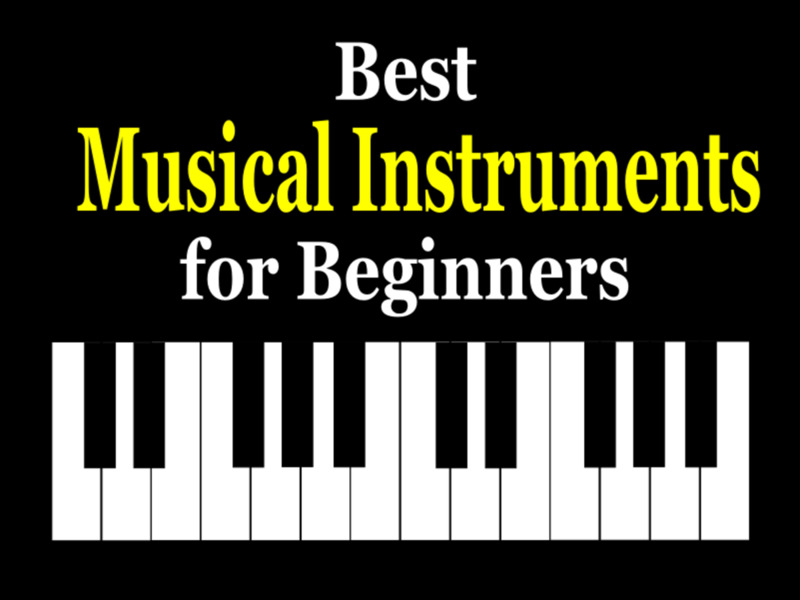 If you have any experience reading music, you’ll know that most music is in one key or another. And unless that key is C major, the key will include a certain number of sharps, flats or both. These are written at the beginning of the piece of music in what we call the key signature. You’d think that would be enough to help us on our way. But in reality, it’s not that easy. The way the key signature is written can make it somewhat difficult to interpret. 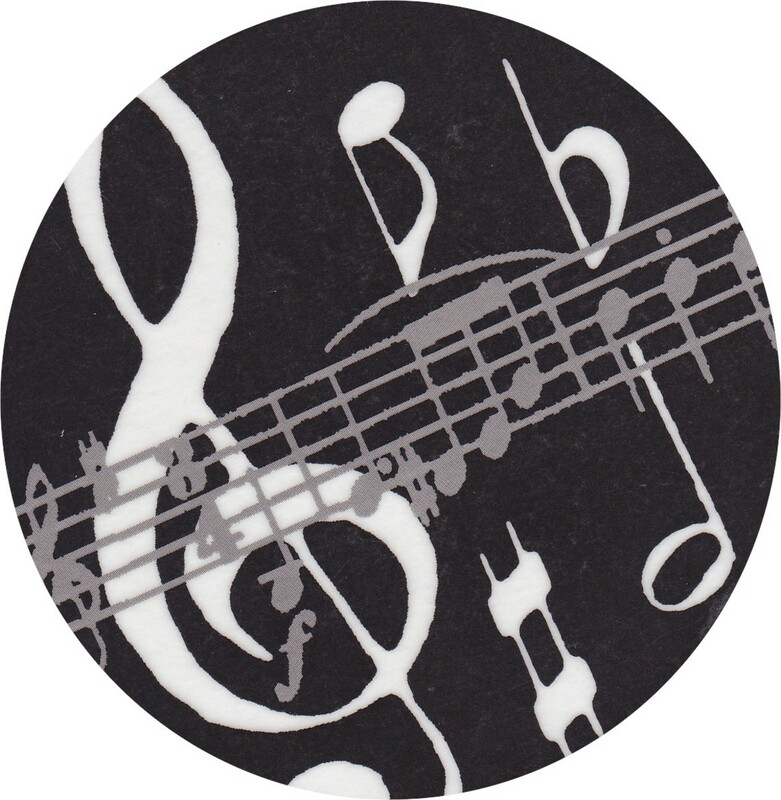 Some people find the treble clef easy to read but struggle with the bass or alto clef. Those of us who play a bass clef instrument like the tuba or cello might have the reverse problem. It’s possible to get around these issues by knowing a few simple tricks of the trade. Once you do, sharps and flats will never puzzle you again. Sharps raise the notes by a half tone, and flats lower the notes by a half tone. They do similar jobs but working in the opposite direction. Likewise, when you try to learn the order of the sharps and flats, you’ll discover that they too are the opposite of each other. 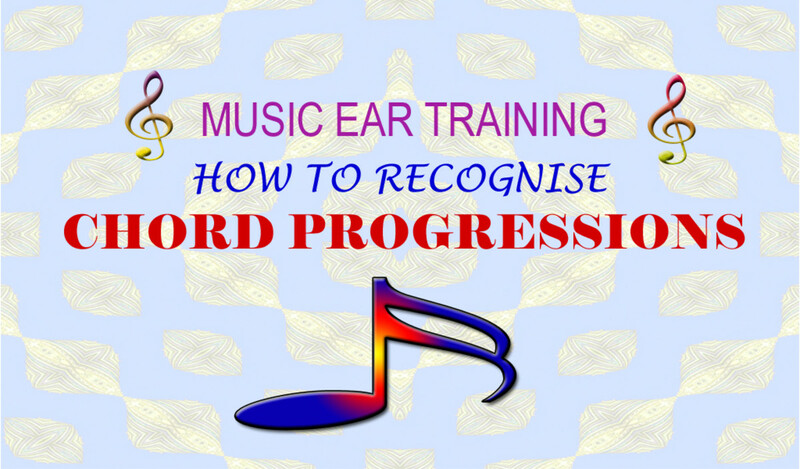 Let’s take a look at the order of the sharps and flats first before we discover some simple ways to remember them. C major has no sharps or flats. To find the key with the first sharp in it, simply count up five notes (remember that sharps raise a note). Count C as note 1, then D, E, F, and G. 5 notes up from C is the note G, which is the first key with a sharp in it. G, then, has one sharp. The sharp is F, which is the note just below G.
To find the next sharp key, count up 5 notes from G. That’s G, A, B, C and D. D is the 5th note, so D is the key with two sharps in it. Those two sharps are F (because that was the name of the first sharp) and C (because that’s the note just below D). See the pattern emerging? To find the next sharp key, count up 5 notes from D. That will take you to A, so we know that A has three sharps in it, and we also know that those sharps are F and C (because they’re the first two sharps) plus G, because that’s the note just below A. Sharp keys are ordered 5 notes up from each other, with the final sharp being the note below the ultimate one, also known as the leading note – such as F in the key of G.
As mentioned earlier, flats work in the opposite way to sharps, but the basic system is the same. Here’s how to do it. C major has no flats. To find the first flat key, count 5 notes BELOW C (remember that flats lower a note). That will take you down to F. To find the name of the first flat, count down one note from where you started (i.e. 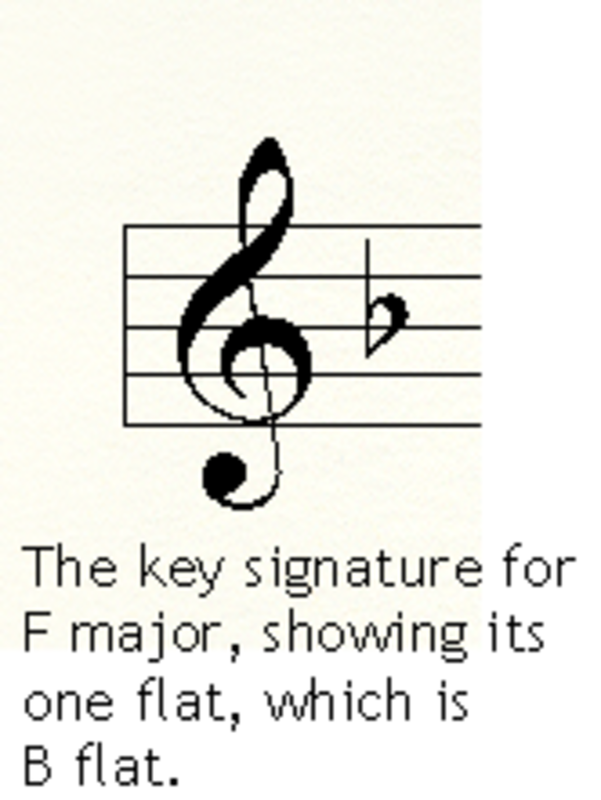 the note C) to the note B. F major has one flat, and that flat is B flat. To find the key with two flats, count down 5 notes from F. That will take you to the note B, but since we’re talking about flat keys, we know it has to be B flat. 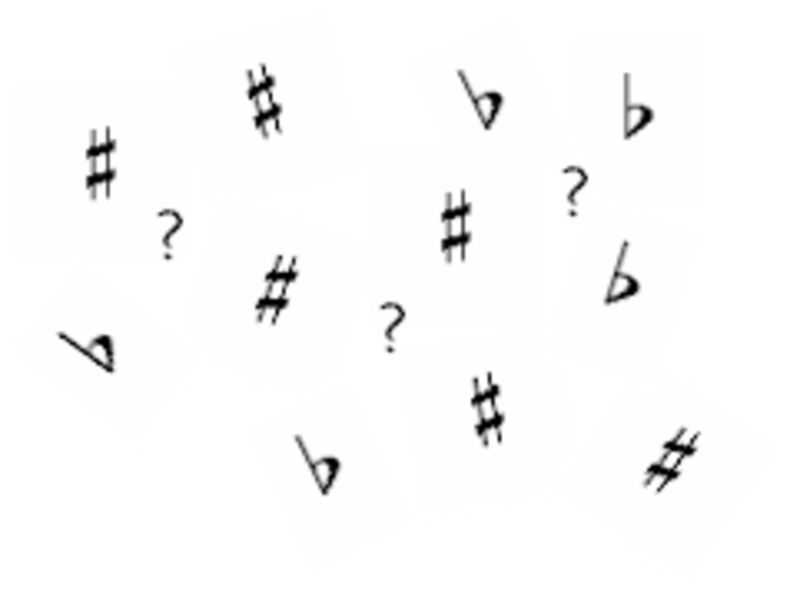 B flat has two flats in the key signature, and we know one of them has to be B, so what do you think the other one might be? Simply count down one note from F (where we started the count to find the key with two flats) and you’ll come to the note E. That’s right; the key of B flat has two flats, B and E.
Some people find all this a bit too mathematical, preferring to memorize the order of flats and sharps instead. There’s no reason not to, but should you happen to forget this technique will always help remind you. For the sake of completion, then, here is the order of the sharps and flats as they appear. If you look closely at these lists you’ll notice something else: each one is the opposite of the other. So if you can memorize just one of them you’ll know them both. Here’s a diagram that combines both methods and might make the whole thing come together a bit easier for you. Minor keys take their key signatures from the major keys they're associated with. We call these minor keys "relative" minors, because they include the key signature and most of the notes from their related major keys. 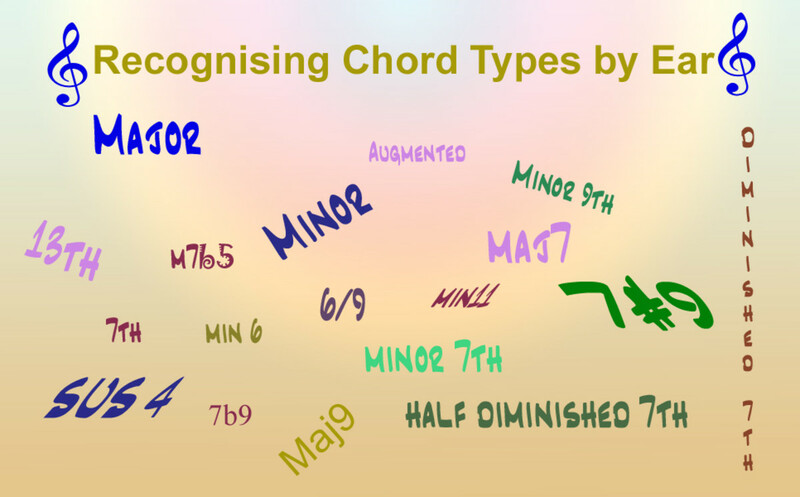 For instance, A minor is relative to C Major. 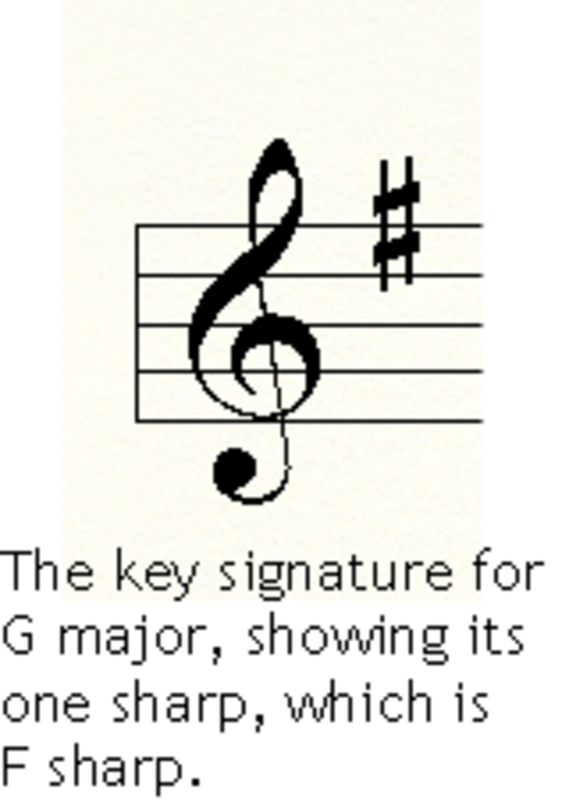 That means that the key signature for A Minor will be the same as it is for C Major - in other words, no sharps or flats. But that's not the end of the story. 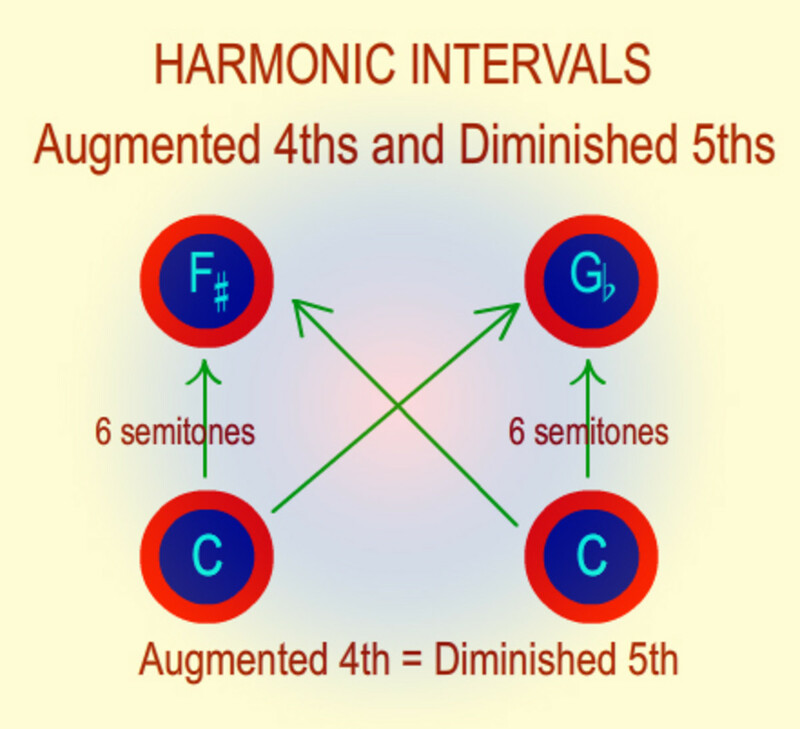 Most of the music you hear will use the harmonic form of the minor scale. That means that the scale will be used to provide harmony as well as melody. 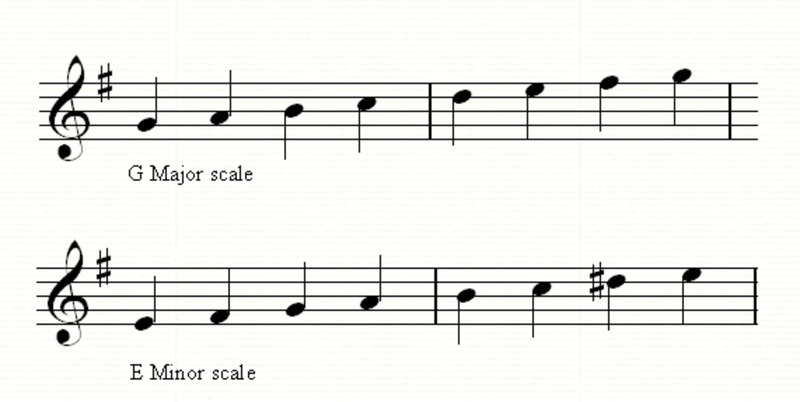 In major scales the seventh degree of the scale is called the leading tone, such as B in the scale of C Major. The leading tone is just a semitone below C - there are no other black or white notes between them. To make music in minor keys work in the same way, it's necessary to raise the leading tone so that it creates a semitone between the seventh and eighth degrees of the scale. So, in the key of A Minor, the leading tone is G. That's why when you play piano music in the key of A minor you'll more than likely find lots of G sharps written into the music. It gives certain points in the music a more final sound, which is especially useful at the end of sections and the end of the song. 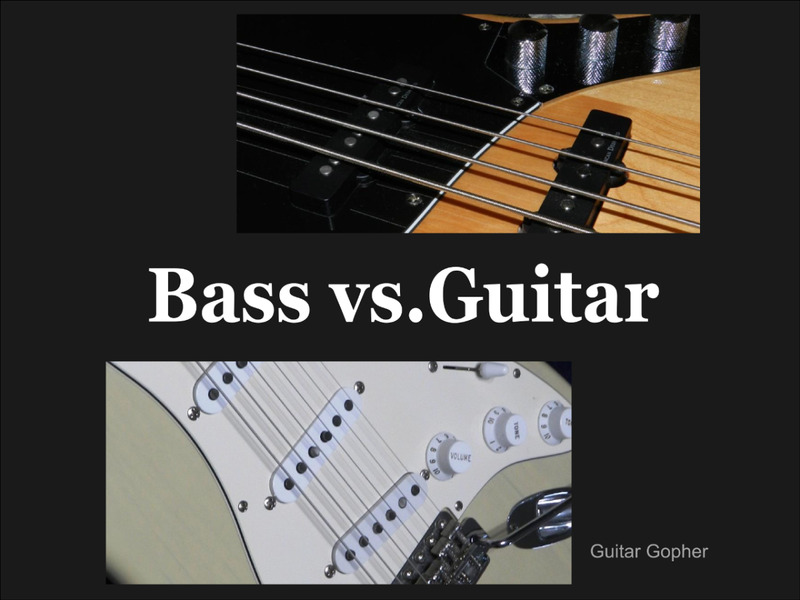 To see and hear the difference, try playing the two examples below. We call these extra sharps written into minor keys "accidentals" - which simply means they don't belong in the key signature. To find the relative minor for any major key, simply count down the scale three semitones. We know that the relative minor key to C Major is A Minor, so we can work out any other relative minor using the same process. For instance, in the key of G Major, if you count down three semitones you'll come to the note E. E is the relative minor to G Major, which means it shares the same key signature of one sharp. We also know that we're going to need to raise the leading tone to make the harmonies sound correct, so that means we'll find D sharps in the music as well. Finally, remember that some minor keys have key signatures with only flats in them. 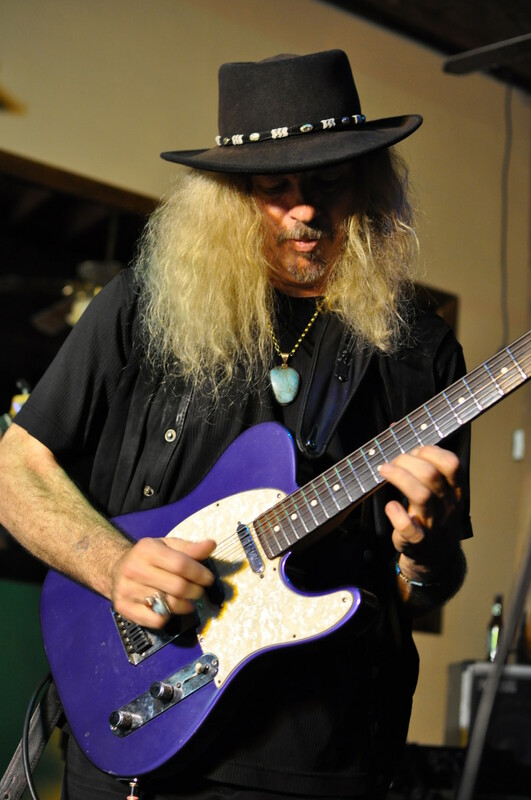 That means that raising the leading tone may have to be done using a natural, instead of a sharp, which has the same effect of "sharpening" the note by a semitone. So if you play the C Minor scale, the second-to-last note you would play would be B natural, and not B flat. Interesting. I remember both. It all depends on which direction on the keybaord I am moving. I don't play, but I have always been baffled when friends look at a piece of music and can instantly tell what key it's in. Now I'll at least have a clue. Thanks! Thank you so very much for this hub. I used to play the piano many years ago now and won four certificates in my piano exams. Sadly I stopped playing a long time ago but this hub has really made it all come flooding back. Maybe its not too late to try again. Thank you so much for this great hub and I now look forward to many more by you.